Home > ティータイム > anotherとotherとothersの違い – What’s the difference between another, other, and others? 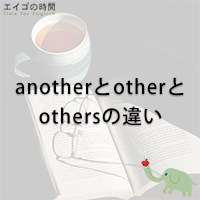 anotherとotherとothersの違い – What’s the difference between another, other, and others? I can’t tell one beer from _____ . I can’t tell one beer from another. They are twins. I can’t tell one from _____ . They are twins. I can’t tell one from the other. The post office is on _____ side of the street. The post office is on the other side of the street. This cake is delicious! Can I have _____ slice, please? This cake is delicious! Can I have another slice, please? There were three books on the table. One is here. Where are _____ ? There were three books on the table. One is here. Where are the others? Some people like this movie, and _____ don’t. Some people like this movie, and others don’t (like this movie).